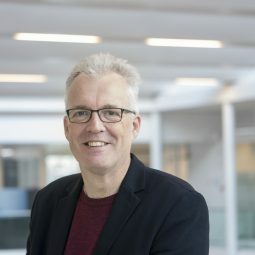 In 2016 KWR continued its activities as a WHO Collaborating Centre for Water Quality and Health for the World Health Organization (WHO). 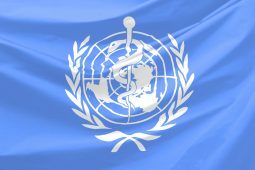 We are one of the test laboratories for the WHO International Scheme to Evaluate Household Water Treatment Technologies. By certifying the performance of water treatment systems, WHO aims to reduce infant mortality caused by diarrhoea in developing countries. We also worked on a practical guide to quantitative microbial risk assessment (QMRA). 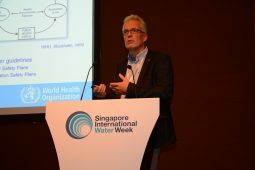 The guide, which is intended for regulatory authorities and water companies, was presented during the Singapore International Water Week. On 11 October 2016, we sealed our long-term collaboration in the field of microbial water quality with Joan Rose and her research group at Michigan State University. 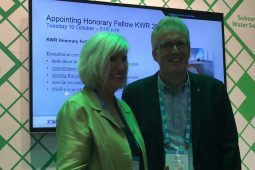 It was our great pleasure to appoint Rose as our second KWR Honorary Fellow.